Information on Lake Tekapo. 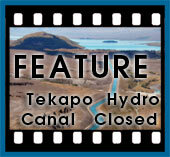 Climate, history, township, hydro scheme, with Tekapo Tourism. View more of our photos or add some of your own. 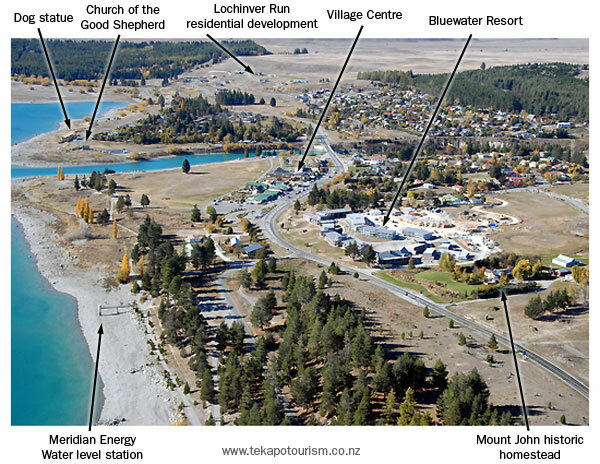 Here are two images on Tekapo Village, displaying key or significant landmarks. The top image is taken from the west and looks towards the east and the direction of Fairlie, Timaru or Christchurch. The second image is taken from the east and looks towards the west and the direction of Twizel, Queenstown or Dunedin. Lake Tekapo - the book. Author Felicity Price and photographer Geoff Mason have combined their talents to produce a revealing and stunning book describing the history and landscape of Lake Tekapo. An essential book for the coffee table. Available at the Lake Tekapo Information Centre and most major accommodation and activity providers in Lake Tekapo. Profits from sales go to local community groups in the Tekapo area. Why is the water of Lake Tekapo turquoise? The majority of water flowing into the headwaters of Lake Tekapo comes from large river systems that extend right back into the valleys of the Southern Alps. Feeding these rivers are large glaciers. Glaciers are slow moving rivers of ice. Glaciers start as fallen snow high on the mountain plateaus of the Alps. As more and more snow falls, the weight of the new snow compresses the older layers until it becomes a thick, heavy layer of ice. Gravity draws the ice from where it formed and down the slopes of the mountains. Just like water, the ice collects in valleys and pushes its way down the valley, ripping loose rock from the valley walls and trapping it in the moving ice. Any rock trapped against the sides of the ice flow is ground, with huge force, along the solid rock of the valley floor and walls. Such is the force, the grinding action of rock against rock results in a powder as fine as flour. It is often referred to as glacial flour. The fine flour is carried with the ice down the valley until the warmth of the lower altitude reduces the ice to water. In the case of Lake Tekapo, the glacial flour continues its journey in the river waters of the Godley, Cass and Macaulay rivers until it flows into the lake where the majority remains suspended within the water. This results in the turquoise colour. At the 2001 census the usually resident population was 303. The overnight population of Lake Tekapo can often double due to the number of visitors to the area. 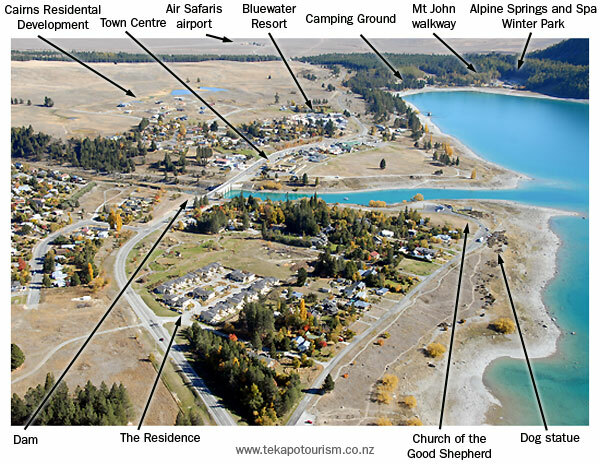 Lake Tekapo's population increases during weekends due to the number of holiday homes in the village. Lake Tekapo village's latitude, longitude and altitude is: S44°00.5' E170°28.7' and 720m above sea level. The designed flood level of the lake is 713m above sea level, but as a hydro lake it is often less than this. Length of the day in Tekapo. New Zealand is located half way between the equator and the South Pole. As a result there is a large difference in the length of the day between the summer and winter seasons. To use the length of the summer day to its best advantage, New Zealand operates on 'daylight saving time' during this period. Clocks are shifted ahead one hour to offset the day, giving the perception of extending the evenings at the expense of the mornings. Great for those long summer evenings around the BBQ. New Zealand Daylight Saving, or Summer Time, now operates from the last Sunday in September until the first Sunday in April. On average Tekapo village only experiences 78 rain days a year producing an annual rainfall of 600mm (23.6"). This increases significantly towards the Southern Alps, above the head of the lake. On average Tekapo experiences 2180 sunshine hours annually. Almost 200hrs above the New Zealand average. The average wind speed throughout the year is 7km/h (4.3mph). The highest wind speed ever recorded in New Zealand of 250km/h (155mph) was recorded on top of Mt John. On average Tekapo experiences 149 ground frosts a year. Lake Tekapo experiences warm summers and very cold winters. The Church of the Good Shepherd is operated by a team of local volunteers. Indicative opening hours vary between summer and winter and can occasionally be dictated by weather conditions. Heavy snow may prevent opening during winter. The statue of the dog on the shores of Lake Tekapo is dedicated to the working collie dogs of the Mackenzie and was commissioned on the 7th of March, 1968. Good local coverage throughout the area. Almost no coverage at the motor camp and Alpine Springs and Spa, at the base of Mt John. The cell site is located on the summit of Mt John. Good 027 coverage in the village with a cell site located behind the village. No coverage at nearby Lake Alexandrina.